Anti-CD1a labels Langerhans cell histiocytosis (Histiocytosis X), extranodal histiocytic sarcoma, a subset of T-lymphoblastic lymphoma/leukemia, and interdigitating dendritic cell sarcoma of the lymph node. MOLT-4 cells. Paracortex in a tonsil or a reactive lymph node. At least five CD1 genes (CD1a, b, c, d, and e) are identified. CD1 proteins have been demonstrated to restrict T cell response to non-peptide lipid and glycolipid antigens and play a role in non-classical antigen presentation. CD1a is a non-polymorphic MHC Class 1 related cell surface glycoprotein, expressed in association with Beta-2 microglobulin. Anti-CD1a labels Langerhans cell histiocytosis (Histiocytosis X), extranodal histiocytic sarcoma, a subset of T-lymphoblastic lymphoma/leukemia, and interdigitating dendritic cell sarcoma of the lymph node. When combined with antibodies against TTF-1 and CD5, anti-CD1a is useful in distinguishing between pulmonary and thymic neoplasms since CD1a is consistently expressed in thymic lymphocytes in both typical and atypical thymomas, but only focally in 1/6 of thymic carcinomas and not in lymphocytes in pulmonary neoplasms. 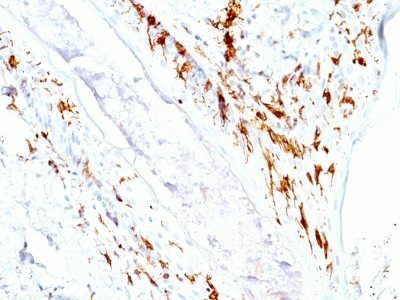 Anti-CD1a is reported to be a new marker for perivascular epithelial cell tumor (PEComa). Catalog number key for antibody number 0717, Anti-CD1a (O10 C1A/711) The prefix indicates conjugation, followed by the antibody number and size suffix.